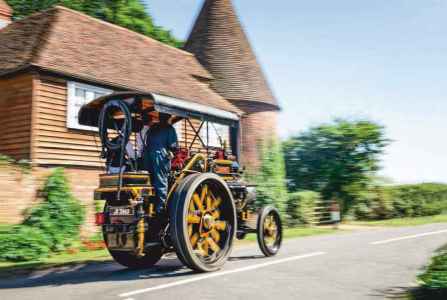 It’s Drive-My’s slowest-ever road test, as we steam through rural Kent on a traction engine. Words Martin Gurdon. Photography Paul Harmer. 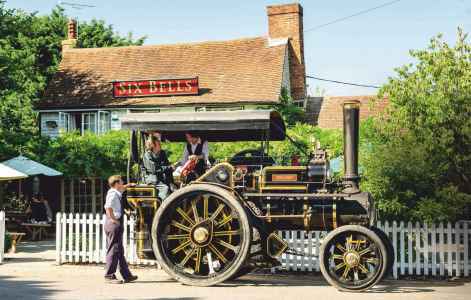 Six miles per hour might not sound fast but, when you’re standing seven feet from the ground, directing several tons of rampaging, steam-powered machinery along a country lane, it feels very quick indeed. I am at the controls - or at least some of the controls - of Colleen, a 91-year-old traction engine built in Leeds by engineering firm John Fowler, because one of my neigbours and his son-in-law Jeremy Martin, who owns Colleen, thought I’d find the experience entertaining. As Jeremy and co-pilot James Taylor (no, not the singer who was married to Carly Simon) take care of keeping the roaring firebox stoked with coal and finesse the large, horizontal, chromed lever that regulates how fast we are going, I wind the steering wheel’s handle back and forth, sometimes setting up an unnerving zig-zag motion. Our unsteady progress is taking us to the Weald of Kent Steam Fair, a sort of Glastonbury for steam traction buffs. We’d met up earlier outside thee George pub in Bethersden, a few miles back. Colleen, Jeremy and James had travelled about 20 miles and needed a rest. All three are well-known to the pub staff, who’d provided butties, cold drinks and a tap to which a hose was attached so that Colleen s thirst could also be quenched. In between discussions about whether there’s enough coal on board for the final five or so miles to the steam fair, Jeremy and James reveal a passion for all things steam-driven that goes back to early childhood and steam- powered models. 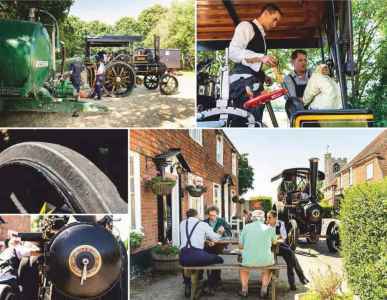 Mining expert Jeremy bought Colleen six years ago, and engineer James has spent his working life fettling steam trains for the Kent and East Sussex Railway. Both clearly love Colleen’s heat, hiss and gurgle. To be strictly accurate, she isn’t a traction engine. As any aficionado of roadgoing steam vehicles will tell you, she’s a bit small at around ten tons, this makes her a steam tractor. Heavy horses survived on many farms well into the industrial age because hefty traction engines would bog down in fields when hauling ploughs. So when steam was used for this task, a pair of engines often stood at opposite ends of a field and used hawsers attached to ploughs. They also handled other tasks, such as powering threshing machines. As with their bigger siblings, steam tractors were also used for towing, hauling everything from showmen’s caravans to roadmenders’ trailers. Colleen started work in 1928 as one of two steam tractors bought by County Tyrone Council. By then, though, steam was being supplanted by petrol and heavy-oil engines and Fowler’s last steam vehicle, a road roller, was made in 1937. On the limit at 12mph; Colleen's thirst is slaked again; driving needs at least two people; the crew get thirsty too; smoke-box door opens for cleaning boiler tubes; the only rear suspension you get. 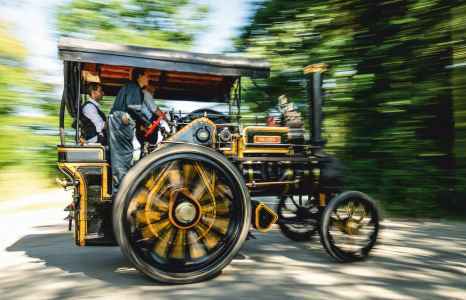 The National Traction Engine Trust has records of 125 steam-vehicle makers, and steam’s properties of instant power and massive torque meant that some of them were reluctant to ditch the power of hot water. Sentinel’s four- cylinder steam lorries were still being made in the 1930s, with a few for export as late as the 1950s, and these sophisticated designs could manage 50mph. That was as fast as some cars. These and other seemingly unromantic steam-powered vehicles, traction engines and road rollers included, also had something else: charisma, this perhaps explains why, more than eight decades after their heyday, so many survive, thee National Traction Engine Trust has 2851 on its books, along with 687 portable engines, 160 steam-powered fire engines and 125 fairground-ride and organ engines. Cere’s a big, benignly insular community of owners, restorers and specialists, who take their coal-fired mastodons to bucolic get-togethers all over the country. Some tow caravans and spend days reaching them. In the 48 hours leading up to the Weald event, close to my house, there’s a great deal of chuffing, whistling and mechanical chatter as lightly sooted people wearing lived-in overalls, flat hats and bowlers rumble along and wave to one another. There’s a real sense of theatre to their slow progress, partly because you hear them coming for a long time before they arrive, and the noises-off continue for ages after they’ve gone, thee fun has been spoiled in recent years by some accidents, though, when fast-moving drivers have erupted round bends to find very slow and very solid things in their way. Several veteran showmen’s caravans have been trashed but, when a car and a traction engine have come together, the cars have come off worse. Some engine owners now rope-in friends with cars with yellow flashing lights attached, which trundle along behind to act as tenders. We are followed by Jeremy’s father-in-law Jonathan ‘Wash’ Hays (so called because of his washboard-playing skills). Sometimes he charges ahead so photographer Paul Harmer can get some glacial moving shots, ‘this might be a bit of a challenge,’ observes Paul. A couple of hefty brake blocks, located inside the enormous rear wheels, can be wound on and off with a handle. Instruments? here’s a circular pressure gauge with an ominous red line, and a water-level indicator that slightly resembles a glass thermometer. Many of the surfaces are hot to the touch. With Jeremy steering and James stoking the maw-like firebox with ‘good Welsh coal’ and fine-tuning the other controls, Colleen gives a snort, a jerk and begins rumbling forward. Piloting a traction engine needs constant effort and great concentration. Dealing with traffic, parked vehicles and smiling pedestrians requires pre-planning and the banter-filled call-and-response of mutual instruction. Patience is also needed when confronted by frequent, near-suicidal overtaking manoeuvres. It’s also extraordinary how something so slow can feel so dramatic, with thrashing conrods, a giant churning flywheel, an indomitable chuff-chuff-chuff of pistons punching back-and-forth, valves opening and closing, unidentifiable noises that sound like mechanical torture but presumably aren’t. And heat, smoke, steam and fire. When it’s my turn to steer I am warned that it’s hard to see the inside front wheel, that ending up in a ditch is a real possibility, and that I need to pay attention. 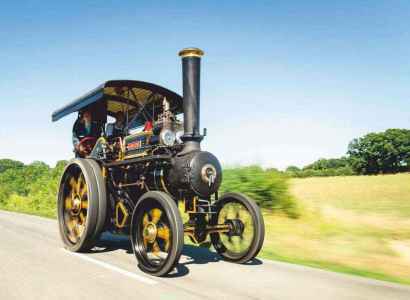 I soon discover that driving a traction engine is like taking up Pilates and smoking at the same time. You assume a position that involves bracing bits of yourself and bending your knees, so you have some physical ‘give’ to save your vertebrae from being squashed together. With no rear suspension and a thick, short, transverse-leaf front spring, Colleen gives a ride akin to falling down a flight of stairs. The steering uses a worm-and-roller box connected by chains to a rigid axle with a single pivot like a soapbox cart’s. On the move this proves faster and lighter than you might expect, but without constant wheel-twirling Colleen tramlines and veers off course and I over-correct, setting up an alarming see-saw motion even at plodding speeds, this is hard work, but oddly exhilarating when everything is pointing the right way. I also have a go with the speed-regulating lever, which requires great mechanical sympathy to avoid too much or too little forward motion. If you’re on (‘in’ hardly seems appropriate) a traction engine that has been fed on inferior coal, it will belch clouds of smutty grey smoke at you. Having almost arrived at our destination we re-water and refuel once more, with muckier anthracite, and Colleen gives us a comprehensive kippering. I am hot and sooty, with overalls and hair giving off a not-unpleasant tang of coal and water vapour marinated in ancient lubricant, and thoroughly elated too. I don’t want this experience to stop, though I am simultaneously glad that it has. If you’re still wondering what the appeal of Colleen and her ilk is, James Taylor sums it up perfectly. ‘She’s a living, breathing thing. You can’t just turn her on and expect her to go.